Three (3) photos are needed for a Mexican passport. Photo size needs to be 4.5 x 3.5 cm. Taken on a white background. No hats, must be bareheaded. The Mexico passport photos must be taken with a maximum of thirty days prior to submitting the application. Both ears must be shown. No eyeglasses, no earrings, no necklaces. No smile, frown or teeth cannot show. The picture should be submitted in 4 copies. While 3 is the official quantity required, the authorities are known to often ask for an additional one while the application is being processed and submitting an extra one will save time. They should be in color and taken against a white or lightly colored plain background. You should be looking directly at the camera. Pictures even slightly in profile have been known to be rejected. Your face should fill between 70 to 80% of the photo area. Note: Please verify with the Mexico Passport Photo Requirements with the Mexican Consular Section of the Embassy. 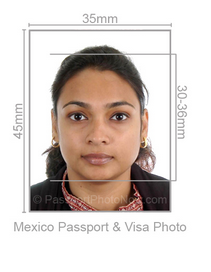 The current Mexico passport photo specifications require (three) 3.5mm by 4.5mm photos to be submitted with the application. The Embassy of United States shows the passport photo specifications for the US passport photo which is 2″ x 2″. Alive Scan can print either one of the two sizes to fit your country passport image requirements. Citizens of some countries do not require visas to enter Mexico. Before traveling to the country is makes sense to check with the Mexican Embassy nearest you as to whether or not you need a visa.